The Quilt Alliance’s keystone project, Quilters’ S.O.S.- Save Our Stories, or QSOS, celebrates an important birthday this year: two decades of preserving the voices of today’s quiltmakers. This unique oral history collection, the largest of its kind in the world, includes over 1,200 interviews with quiltmakers. Each quiltmaker interviewed between 1999 and 2017 is represented in the collection with an audio recording, a written transcript and photographs of the quilt, often pictured with the maker. Georgia Bonesteel was the first QSOS interviewee, shown here (at left) in 1999 with Karen Musgrave, instrumental project volunteer, and Dr. Bernard Herman, one of the founders of the project. 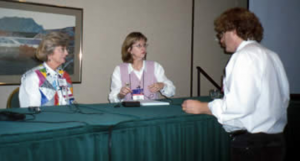 The first interviews were conducted at the International Quilt Festival in 1999 with backing from Quilt Alliance founders Karey Bresenhan, Nancy O’Bryant Puentes (both of Quilts, Inc), and Shelly Zegart (of the Kentucky Quilt Project), as well as key Quilt Alliance board members. From 1999 until January 2007, the Quilt Alliance partnered with the University of Delaware, Center for Material Culture Studies, under the guidance of Dr. Bernard Herman, to house QSOS records. From January 2007, the American Folklife Center at the Library of Congress has served as the physical archive for QSOS interview materials. Researchers, in addition to accessing interview transcripts and photographs online via the Quilt Alliance website, can access audio recordings of interviews and related materials directly from the Library of Congress. Since its inception, QSOS has been a grassroots project with volunteer leadership. Volunteers, lead for many years by artist and Quilt Alliance board alumni Karen Musgrave, conducted interviews and curated exhibitions drawn from the archive. In addition, scholars have utilized the archive of interviews in their research. The interviews show us the complexity and diversity of quiltmakers and their quilts. Thanks to the hard work of our volunteers, the anonymous quiltmaker has gained a voice. As we enter the 20th year of the project we are adding a new level of accessibility to this collection of voices. The migration, already underway, will move all interviews and their audio recordings to a new website, qsos.quiltalliance.org. 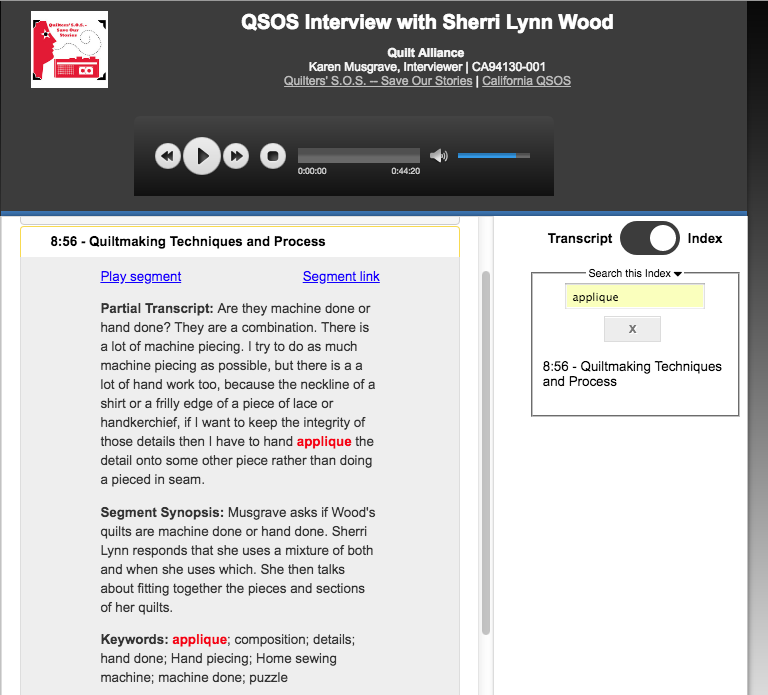 Twenty QSOS interviews have been added to the new site so far, allowing users to listen to the recordings for the first time online. New features allow users to search and browse the interview transcript, create links to specific playback points in the recording, and view an index for each interview. Indexing is done by project volunteers or staff members and entails the creation of a partial transcript, a synopsis and keywords for each section of the interview, all of which make the collection easier to search and browse. 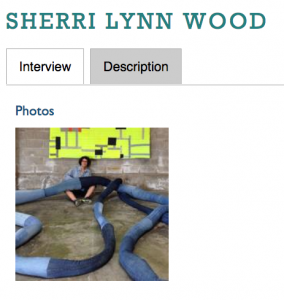 One segment of Sherri Lynn Wood’s 2009 QSOS interview is shown here. The Quilt Alliance is now raising funds to support this transition and to date, 241 interviews have been sponsored by generous supporters. 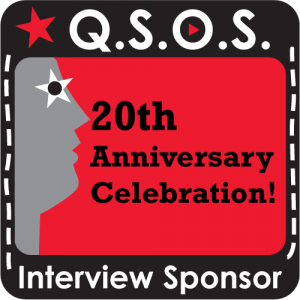 To sponsor an interview, visit the new QSOS website and make a contribution of $25 or more. 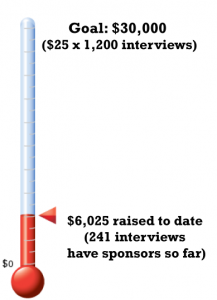 Your donation will help us cover the cost of preparing an interview to be made available on our new QSOS platform. That includes the costs associated with cassette digitization, file formatting, transcript editing and indexing, web hosting, and other fees. View a list of QSOS Sponsors to date here.